I’ve said that Panama has four seasons: Sun Glorious Sun, When will it every Rain, Rain Glorious Rain, Dear Lord when will we see the Sun. The dry season is hot and dry, and the fields and roadsides are burned casting a pall of smoke over much of the country. We are entering the dry season now (December) and it will be Sun Glorious Sun for the next three to four months. By then we will be wishing for rain, to clear and damp down the dust, and to bring green back to the city and countryside. When the rainy season does arrive, it will rain more each month for nine months than the highest precipitation months for London in the UK. Or to put it another way, for only three months of the year will the rainfall in Panama City be less than the highest monthly rainfall in London. The rain in London pokes at you, for hours, with cold little stabs all over any exposed skin. It is also driven by the breeze or wind, so it hits you sideways and does so all day long. It is as if God poured a jug of cold water over you and then sent it around and around in the wind, to hit you from every direction. Certainly, London has downpours, the wonderful April Showers to bring May Flowers. But mostly, the rain is a long drawn out affair, and once it starts you know that the day will be spent indoors if at all possible. Panama City rain is different. It is tropical rain. The best description that I have is that God drops a dumpster full of water onto you. It crashes down for 30 – 45 minutes, then stops. Except of course for the deepest part of the rainy season, when all you really want is a few hours of sunshine. Let's look at what that means. 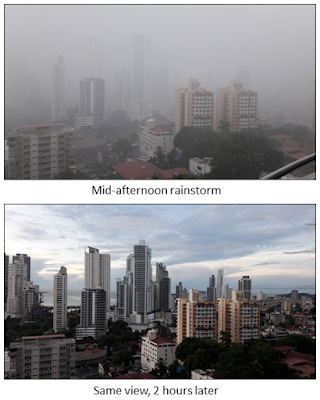 The upper photo was taken during a rainstorm. Not a terribly strong storm, as you can actually see the buildings in the background. The lower photo was taken a few hours later when the rains had cleared. In a very strong rain, none of the buildings in these two photos is visible. What is the impact of heavy rain on your car? I was stumped. Well, yes, driving more slowly makes sense, and certainly watching for other drivers is important – critical in fact. Emergency lighting makes a lot of sense with the intensity of the downpours. But no, the right answer is B) your car stops. At face value that just doesn’t make any sense. My car, well, any car I’ve owned, can drive perfectly adequately through the rain. And why would my car stop just because it is raining. The real meaning of answer B) is that the roads will flood, and any lower land or poorly draining areas will flood. And they will flood quickly. While the municipal drainage systems are reasonably good, the volumes of water simply overwhelm them, and very quickly some of the key roads will be a couple of feet (most of a meter) deep with fast flowing water. Yet for all that rain, the most wonderful things about it are that the rains clear the humidity (for a short period) and the rain is not cold, though it does take the heat out of the air. It a real pleasure to sit on a balcony during a rainstorm and be able to stay dry and cool.